I saw the ‘Sponsored’ offer floating around Facebook and decided to try Plated next! The Offer was for $40 off a week’s delivery! Now, I can offer YOU two (2) Free Plates with your first week. Plated offers a minimum of four (4) ‘plates’ per week…in other words, 2 meals for 2 people. This can be increased all the way to six (6) plates per meal/recipe. We used our plates for either Lunch or Dinner depending on the meal and our interests for the day. This is a gourmet delivery service, there is no presumption of time to prepare, as it’s about the experience. Plates range from $12-$24 per plate, depending on how fancy and ingredient heavy the recipe is! Shipping is included, however that’s a range of $24-$96 for the minimum of four (4) plates. To compare apples to apples, I’ll use the base price, so six (6) total plates will be…$72.00 per week! 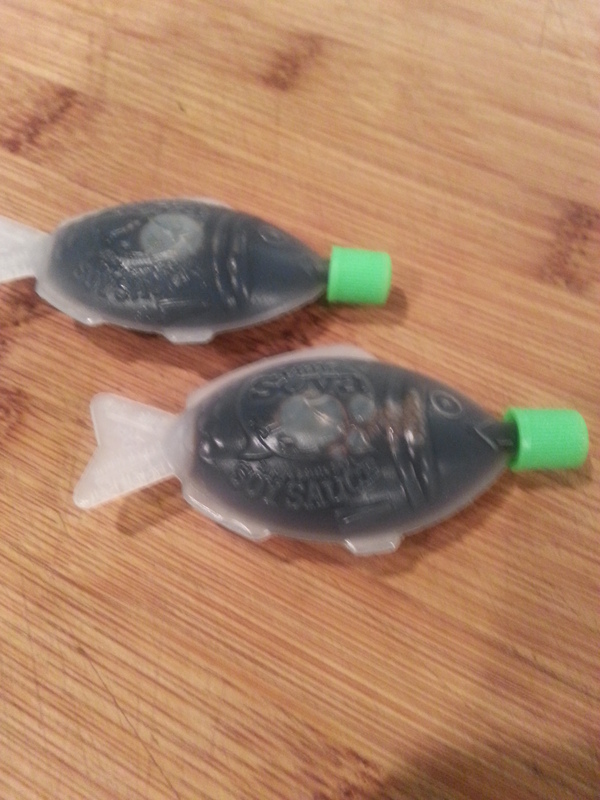 ~ Fresh ingredients, including hormone free meat and sustainable seafood. ~ One can choose Vegetarian plates, which are typically always base price. ~ True to listed prep time…within about 10mins. So I knew what to expect. Beef, Poultry, Vegetarian, Lamb, Pork, Fish, Seafood. ~ Delivery options allow for weekly or every other week/fortnightly shipments. 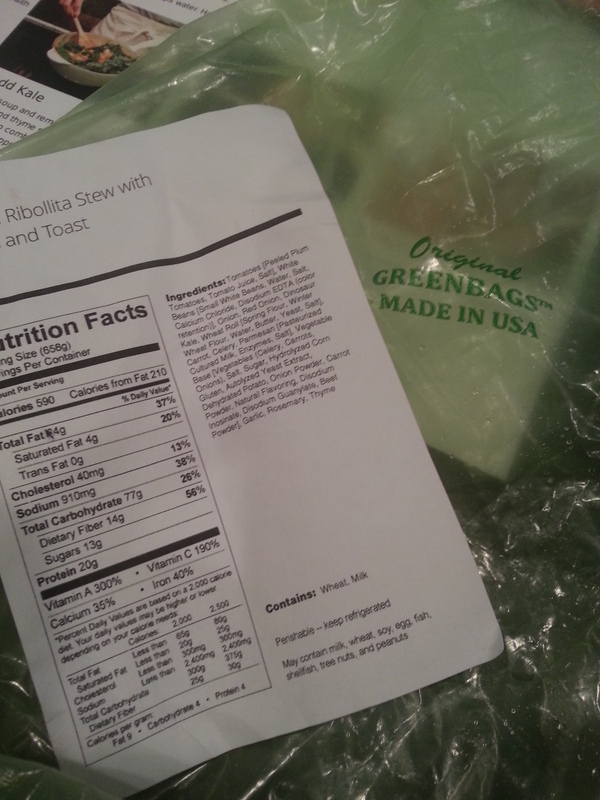 ~ Nutritional Facts, including allergen ingredients, on each meal’s ingredient bag. ~ I enjoyed that each ingredient was label with the meal title it joins with! ~ The ‘Taste Profile’ is limited and only offers the opportunity to select main entree types : Poultry, Fish, Vegetarian, Lamb, Beef, Shellfish, Pork. ~ Ordering! UGH! Really!? It was not as straight forward at BlueApron, in which they simply picked 3 meals for you and if you made no modifications then they would send those 3 meals! At Plated, you have to go in and pick your meals (they do not auto-select for you) and then you must ‘check out’ in order for those meals to be delivered. Of course, my first week I didn’t understand this and upon calling on ‘drop day’ to ask if it was going to ship or not, they simply told me that I wouldn’t be getting my box that week (2nd week). UGH! I was left in a lurch, because BlueApron couldn’t pick up the slack that late in the week…so, I just went to the market myself! HA! No big deal, of course! But, of course, it was annoying. This was a nice way to make a gourmet soup. 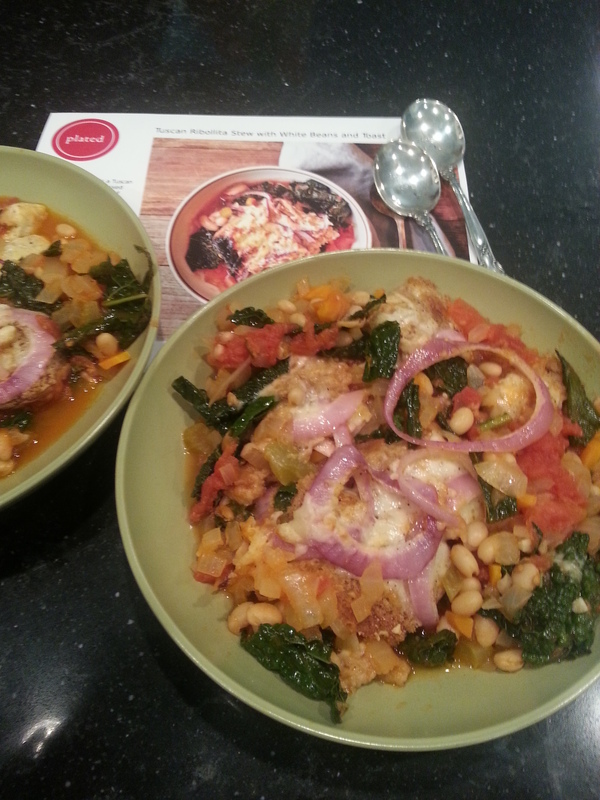 I loved the white bean and kale ingredients. I enjoyed the final preparation of broiling with sliced red onion and added cheese. This was yummy and offered us leftovers! Miso Hungry…Indeed! Soup Nazi…because…Seinfeld fan here! Modifications : Added Mozzarella atop. 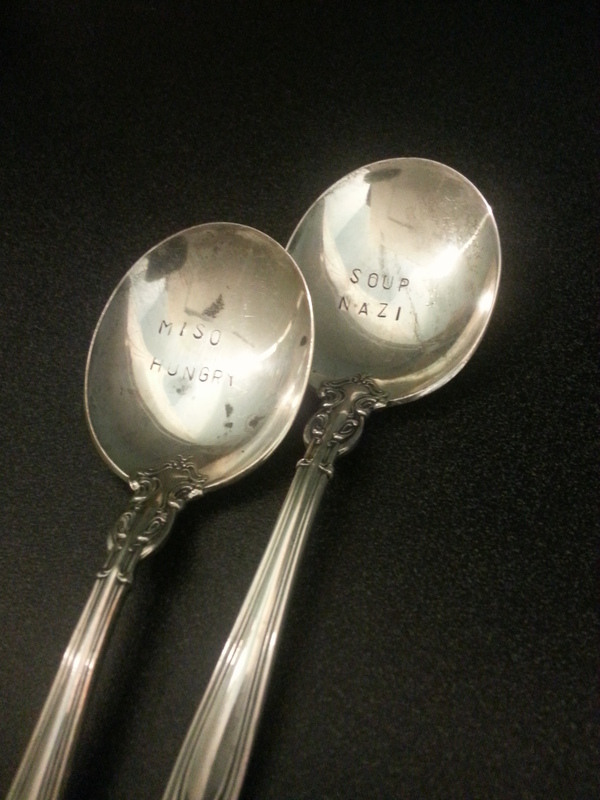 PLUS…I was stoked we got to use our custom Soup Spoons, created by my friends at Colette’s Lemon Tree! I’d never prepared miso before and was stoked to use this as an ingredient. 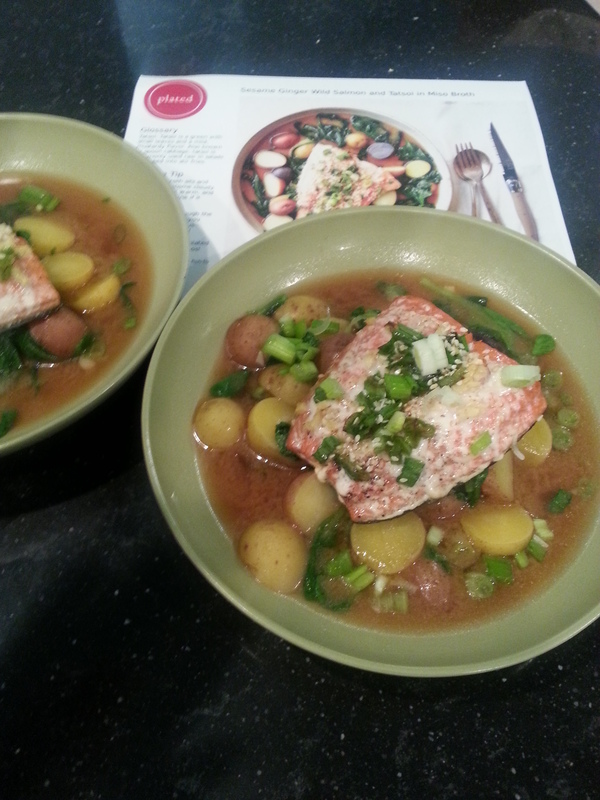 It turned out lovely, fun to have potatoes and tatsoi (greens) in this dish. This made me unafraid to begin using miso on my own…in my own soup creations! For some reason, I kept putting off making this third meal. I liked what Plated was offering, but it wasn’t super duper overly wow’ed by the the supposed gourmet-ness of it all. So, I lost interest with a simple roast chicken dish…by the time I went to it a few days later, chicken when bad, of course, that was, actually, my bad to begin with! So, we brought home some Chicken Thighs instead and set out to prepare the dish. I liked the marinade, it was yummy, and the addition of dates was a novel approach. Modifications : Bought Chicken Thighs to use. I just couldn’t get motivated enough to move forward with Plated. I guess this mean you’ll figure out that Plated was not the winner, but stay tuned there is one more service! And then a Winner will be announced! Good, I can see the potential for lovely, gourmet meals. 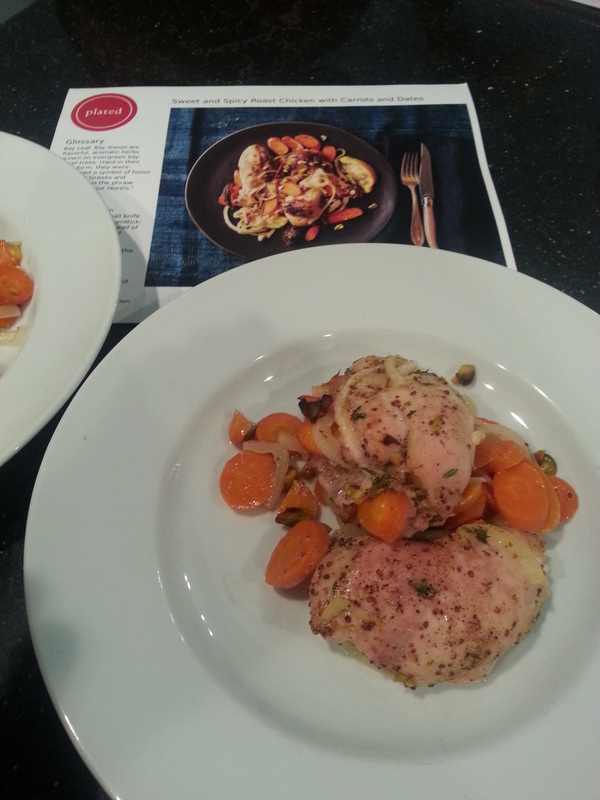 But the cost compared to other services and the pain of ordering squelch my interest in using Plated. I love how they have the nutrition facts for each meal presented on the bag that contains each meals ingredients! Be sure to check back this week…I’ll be posting parts 3, and 4 every couple days! 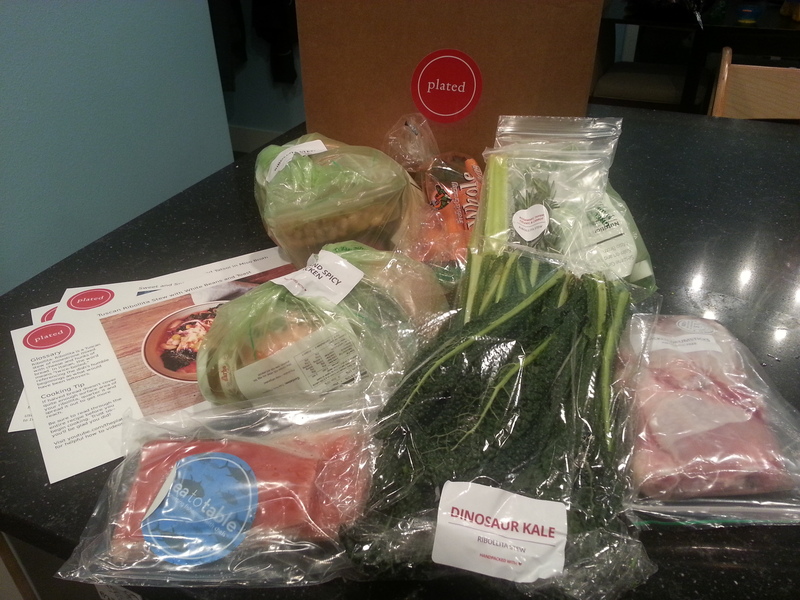 Next up…Hello Fresh review!